The thick, amber-colored syrup is the sticky stuff of legend. Its smoky, nutty flavor is less sweet than maple, more complex, and hauntingly unique. And the thousands of chefs and home gourmets who count themselves among the converted can tell you that Gordon Jones is definitely not barking up the wrong tree. Jones and wife Sherrie Yarling, the country's sole producers of Shagbark Hickory Syrup, live and work on 64-acres of land in Brown County, Indiana that boasts a six-acre lake, and rich groves of hickory, ash, oak and poplar trees. But it is the shagbark hickory-specifically the bark-that provides Jones and Yarling their livelihood in the form of the luscious condiment that has palates panting for more. Each bottle of the filtered and aged syrup ("like fine wine," says Jones) is like liquid Americana. The process of distilling the extract from the bark dates back to the Native Americans indigenous to the region. The origins of the exact recipe are at least 200 years old, passed on to them by a mysterious elderly man buying firewood. 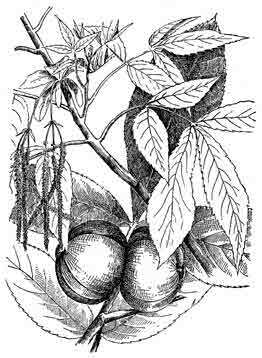 He remarked that his great-great-grandmother had made syrup from the bark of the hickory trees. When the man returned for more firewood, Jones-undaunted by a few botched batches-offered to trade the wood for the recipe. The couple spent countless hours tweaking the recipe, working out the packaging and distribution. "It was definitely a labor of love," remarked Jones, who moved with Yarling in 1990 from Palm Beach, Florida to cultivate Shiitake mushrooms on the acreage. Now, over ten years and as many expansions in production later, Jones and Yarling are still the sole employees of Hickoryworks, where they handle the production, distribution and marketing of the syrup to a growing clientele. They also sell a syrup made from the tulip poplars (historically used to flavor spruce beer) plentiful on their property. In contrast, the poplar syrup is very floral in character and far more delicate than the shagbark. In addition, they offer a shagbark barbecue sauce-Brown County Gourmet " BS " that Jones developed, and soon a Sugar FREE hickory Syrup. Jones is also putting the finishing touches on a cookbook of recipes collected from his customers, chefs and creative home cooks around the country, as well as some he and his wife have developed in their own kitchen. The recipes-some of which can be found at their website-use the syrup in desserts (like crème brulee), sauces (like homemade catsup and salad dressings), and as an ingredient in savory dishes from sweet potatoes to salmon. Even cocktails, the Shagbark Julep for one, are included. "It pairs very well with Bourbon," says Jones, who is quick to mention that Julia Child uses that mixture as a glaze on ribs. Before Hickoryworks, Yarling was a paralegal for 17 years, and Jones had worn many hats in publishing, advertising, sales, as well as managing hotels and restaurants. "Now, when I wake up in the morning and my feet hit the floor, I'm at work," says Jones. "And my wife is the CEO." With business flourishing and so much syrup lying around, it is no wonder life for Gordon Jones is so sweet.